…..has led to this. 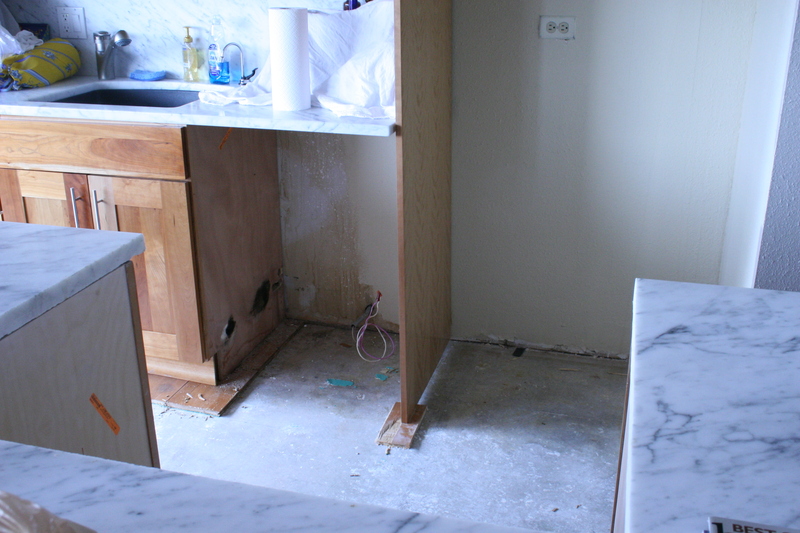 My beloved tiny kitchen flooded from a condo renovation upstairs gone wrong. The floor buckled and has to be replaced, my appliances are visiting the living room, my sink is on hiatus, aaaaacck! There are no worries, insurance will cover everything, life goes on, cooking will eventually resume. Now you know the reason for my silence. It’s been tough to be away from you, but I thought we might have some fun for the next few weeks while everything gets put to right. 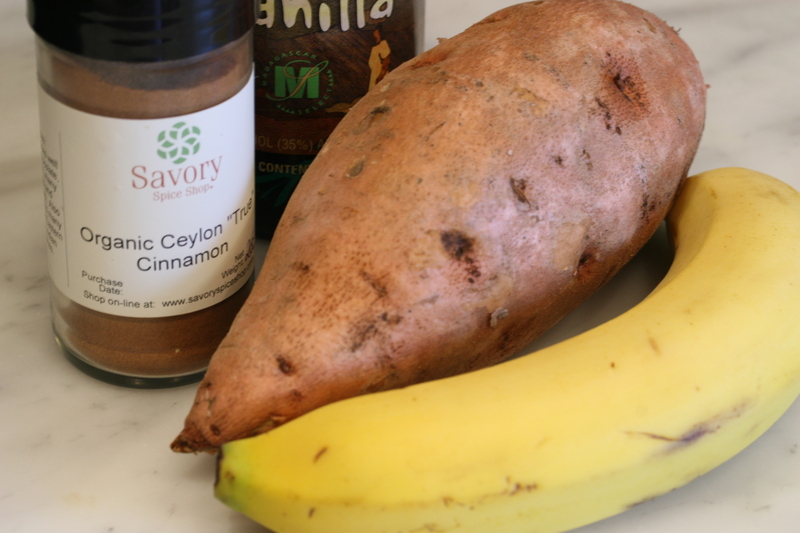 Have a favorite recipe you’d like to share? Send it to me! Live in the Denver area? I’ll come to you and take the photos while you cook and talk, and share your story and recipe here. Come on, help me out! It would be so great to have you here, and it would (insert dramatic music, watering eyes, and brave sniffles) help keep me occupied while contractors run amok and the cat hides. Leave a comment with contact info or e-mail me at Clairec@aol.com. No kidding, it’ll be fun! How many holiday parties have you attended already? It’s December 9th. Thinking about it, it’s just about half way through the time for all the festive drinks, nibbles, and potlucks. If you’re anything like me, I’m already looking for things to save time, be super easy and stress free. The things I put out for my much-loved family and friends has to be good. The food I bring to other’s homes has to get there intact, look great, and above all…taste good. 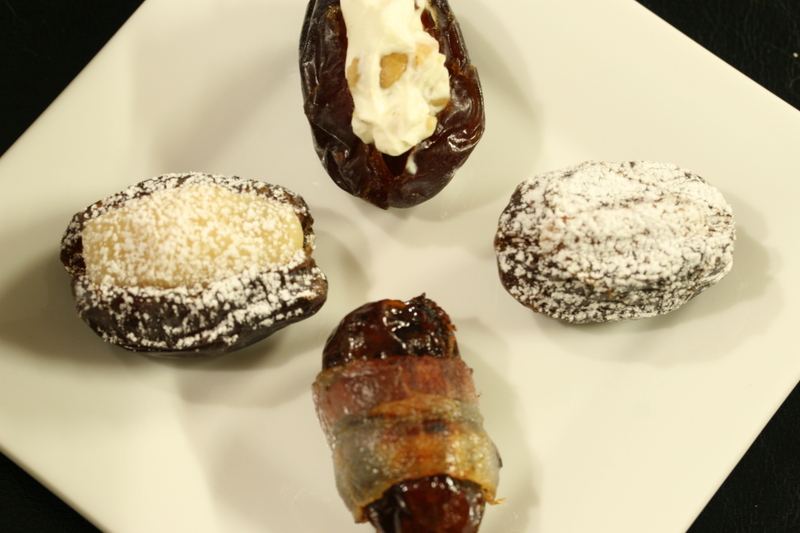 These stuffed and wrapped dates are pure simplicity, so much so that I feel a bit silly telling you about them ’cause I’m sure you know all about them. And make them. But, but, in case there’s one person who reads this and doesn’t know about them, I feel the need to share. All of these are fast, fool-proof, and incredibly good. The bacon wrapped version are so good that you see caterers serving them all year long at fancy parties. They’ve been served as a passed hors d’oeuvre at both my parents 50th anniversary party and my sister’s wedding. They were sent into the bridal party to keep us all from fainting from the caterer knowing they were a favorite of ours. The pecan stuffed, powder sugared ones my southern grandmother made at the holidays. I remember them on a milk glass lacy edged plate. Cream cheese and walnut? Directly adapted from my childhood memories of mom spreading cream cheese on thick, moist date nut bread and being surprised that a small bite could fill your whole mouth with flavor and richness. Marzipan stuffed ones. Yep, marzipan. For Prince Charming, as I know no other who loves marzipan more than him. Try it out. Bring them to the next party. Pile them on small plates and set them around the room at your next gathering. Everyone will be happy. It’s December 1. Hard to type, even harder to comprehend. And I’ve already hit the wall. Thanksgiving is done, Black Friday has passed, lights are twinkling, holiday songs are playing, and it’s even snowing tonight. But I’ve had enough today. I feel like I haven’t had time to process it all. The panic is starting to set in, before I actually knew I was panicking! It’s a tough one this year. For all of us. I saw a lot of worried faces this weekend. A lot of “deer in the headlights” expressions walking through the decorated stores, almost like they couldn’t believe this was happening. I know people are worried, it seems about almost everything. Many shoulders are feeling the burden of the uncertain and frankly a bit frightening times we’re living right now. But we’re resilient, people, we really are. We’ll smile, we’ll give thanks again for what we have, we’ll give a helping hand to another in need. We’ll hear that version of “Santa Baby” playing on the radio that makes us laugh, we’ll get the schedules figured out so we can fit almost everything in, our families and friends will hug and kiss us, the wine will warm us, and all will be okay. It will, that’s who we are. But today, I had enough of the holiday food. I couldn’t bear another cream laden, butter stuffed, maple, marshmallow, pumpkin covered morsel. I know, I know, there is so much more to come. And I will be held accountable by many I’m sure of being a contributor to multiple buttons popping and ” Deep breath, pull tight, there! It fits!” moments. Guilty. You will be too. But tonight I needed something different. My cells couldn’t breathe. My little tiny taste buds went on strike. I want something zingy and fresh. Something spicy with different textures. Somehow with 20 degrees and snow outside, salad wasn’t calling my name. But this was. Lime-soy Soba noodles. Vegetables, one roasted, one wilted, a couple barely warm, one raw. 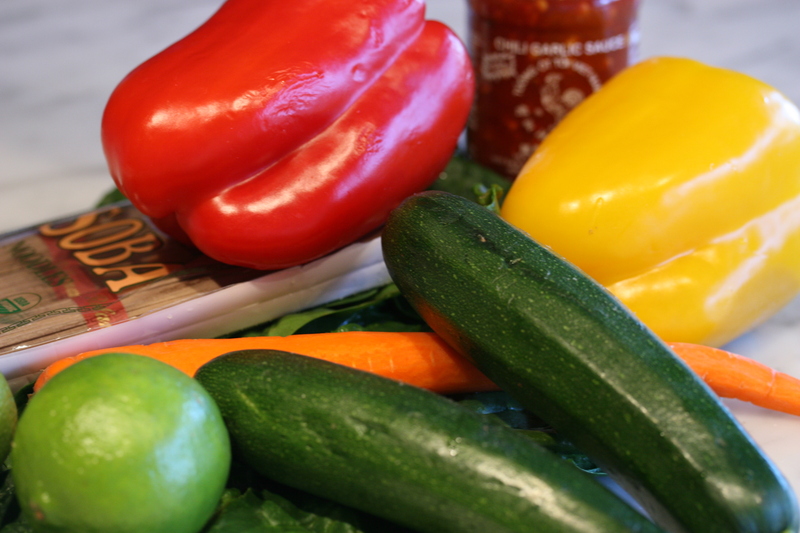 Garlic chile paste to gently burn those taste buds back into action. Healthy. Light but filling! No fat! (ok, well only 1 teaspoon, shhh.) Sheesh! I’m starting to sound like Jack LaLane! You too can do 100 one-handed push ups after eating this meal! 200 if you juice it! Ha. Slight exaggeration. Ok. Huge. You won’t be able to do any push up unless you could before this dish, and you’re not going to jump up from the table and start singing “Here I am to save the day!”. But, but…….you might feel a little lighter in spirit. And I promise, in the midst of all the holiday cakes and pies, drinks and nibbles, shots and sauces we have coming I’ll keep putting these kind of recipes in there. Something to wake us up, shake it loose, so we can get back to sugar covered gingerbread with a smile.